Understanding the role of communication in our daily lives is a topic that many have written about, however we must also begin to understand the role of communication in our internal lives. It is through one’s self talk that we begin to really understand how communication affects how we move about in the world. Self-talk is arguably one of the first methods we use to orient ourselves in the world around us and is certainly influenced by our core Enneagram style. We decide through our internal, intrapersonal dialogue, what we want to convey to others and what we choose to leave out of our communication with others. Intrapersonal communication is defined as talk that remains internal. This can be talk about situations, our selves, or other people. Most people do not practice 100 percent transparency, and so we are quite selective about what percentage of our self-messages we allow others to see. Once we understand how we transmute our internal self-messages into our external messages we can begin to make modifications when something is no longer serving our greater happiness. For example, many One’s may have the self-message “I must be perfect” which in turn gets projected to the outside world to, “you must be perfect”. It is the self-message and its projection that can create problems and often causes Ones unnecessary conflict in the world. Once we understand our core Enneagram style and its messages we can begin to unravel the messages that we are sending to our innermost self via the ego. We also gain an understanding of how those messages can serve to sabotage or boost our main objective, which for most people, is to experience balance or happiness. Intrapersonal talk is the psychological fuel to our external actions in the world. Some people are very aware of their intrapersonal dialogue, in fact, some personality types may be more aware of the dialogue to the extent that it can inhibit self-expression or bolster self-consciousness. For Example, Fours may be hyper aware of their more conscious intrapersonal talk such as “nothing ever goes right” or “I’m sad” or “Why don’t they notice me?” but these surface reflections do not illuminate the "real" talk happening on the deeper ego levels (despite the Fours belief that attention to this self talk creates self-awareness). On a deeper level, behind the internal message “nothing ever goes right” is a subtle whisper that saying, “something is wrong with me, I am not right, therefore nothing goes right.” However, the more palatable message of “nothing ever goes right” replaces the potentially difficult message that there is something fundamentally wrong with the Four. For some these surface messages may begin shouting and thus become difficult to silence, particularly in times of stress. However, if we can begin to listen to the whisper of our self-talk (both on a positive and negative level) we can utilize our intrapersonal communication skills to benefit our self-growth. Self-awareness grows as we integrate deeper levels of information about others and ourselves. Many psychologists have called these internal dialogues “tapes”, and this is an appropriate metaphor for how many people experience the voice of the ego. It is the ego that believes it is keeping the organism alive, and while the ego can be useful to help navigate daily life when it begins to play tapes without our permission, it’s a bit like an annoying house guest who plays that one song on the radio you can’t get out of your head but wish would disappear. Becoming aware that the song is playing is half the battle, the other half is to recognize when the song creeps back in and starts to permeate the beautiful music that might be going on right in front of you. As we begin to realize how our intrapersonal communication shapes our communication in daily life we become increasingly more aware of how our self-messages can produce surprising shifts in our everyday presentation. Our underlying message is often the core fear of the dominant personality type. For example, a Six might have the underlying tape of “I don’t want to be abandoned”, however, because this is a core fear of the Six it is often replaced with something easier to integrate such as “I must be loyal and trustworthy” or “I am a good friend”. So, every conscious and unconscious decision will seek to reinforce these intrapersonal tapes creating a variety of behaviors that serve the various levels of tapes that may be playing simultaneously within the Six. Recognizing the tape, naming the song ( locating the primary Enneagram type messages) and deconstructing the tape (questioning the inherent truth and validity of the message) can help to free us from the tyrannical control of those annoying tapes. This does not mean the tape goes away permanently. The ego is useful when controlled and honestly recognized. Destroying the tape may seem attractive (particularly in some spiritual circles) but ultimately; it is a survival mechanism and a product of being in the human condition. 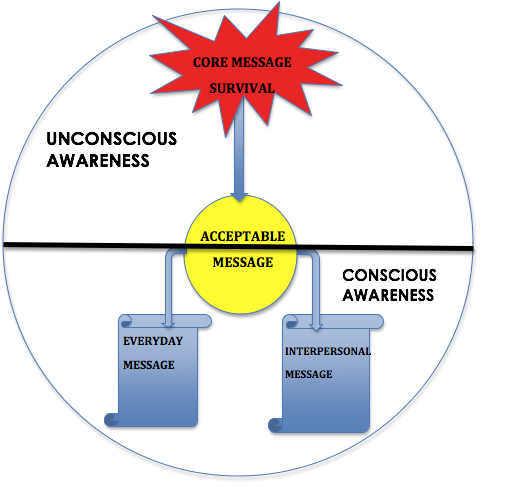 Each of the 9 types has a primary tape and a corresponding more “acceptable” message that they communicate to themselves and then consequently to others. We can go on to identify the whole CD or concerto of musical selections the ego uses but if we think of the primary Enneagram type as the composer, then all of the subsequent tracks on the tape seek to support the identity of the composer. We may have a track that we play in relationships, at work, with our parents, at a party, at the supermarket, or trying on new clothes. Some people’s messages may only vary slightly while others may have drastically different flavorings which still seek to serve the overall flavor or image of the managing artist (the ego). Think of the artist as seeking to communicate a fundamental belief or core fear that keeps the person alive, and laying layer upon layer of instrumentation or vocals on top of this fundamental fear in order to communicate that message on different levels. contains the core unconscious fear that is fed to the conscious brain to keep the organism alive. This is the message the ego uses to promote self survival. contains a re-framed less fearful core message. The acceptable message takes the "crazy idea" behind the core message and makes it less threatening and easier for the ego to process. This tape is often semi-conscious. contains "marching orders", that tells the organism how to behave in everyday life. This message steers most behaviors, and is usually fully conscious. contains the messages we send to other people to navigate the world and is often co-conscious with the everyday message.